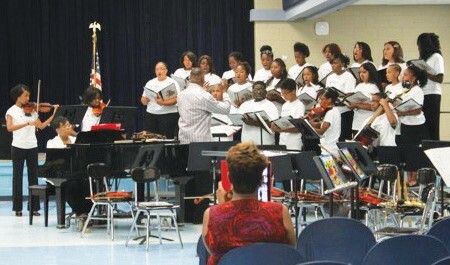 BRAVO Music Company’s 20th Annual Summer Music Camp will be held at Ramah SDA Junior Academy located at 3400 Florance Street, Savannah, GA 31405. This camp is scheduled for 2 weeks (9 days, does not include the 4th of July) beginning Monday July 2, 2018 to Friday July 13, 2018. Camp hours are 8 am to 5 pm, each week; Early drop off is available at 7:30 am with breakfast. Hot Lunch is served daily. Pick up by 5:30 pm each day. Camp Activities Include: band, strings, theory, music appreciation, private tutoring, vocal technic, beginner’s keyboard, piano master classes, ensembles and arts and crafts. Physical fitness is also a part of the camp’s daily schedule. This Camp is structured for campers 5 to 18 years of age. Staff includes professional musicians, guest artists, and community volunteers. Summer camp fee is $385.00 per camper and each additional family member is $285.00. A $50.00 non–refundable registration fee per camper. Limited scholarships are available. To register for the 2018 camp visit our website at www.bravomusiccompany.com or email us at clef2008@peoplepc.com or call at 912-236-6681(voice mail 24/7), 912-856-1501. The culminating program will be held at Bethel A.M.E. Church located at 1814 East 38th Street, Savannah, GA Friday, 7/13/2018 at 4 pm. Marc A. Smith, President and Rose O. Smith, Camp Coordinator.